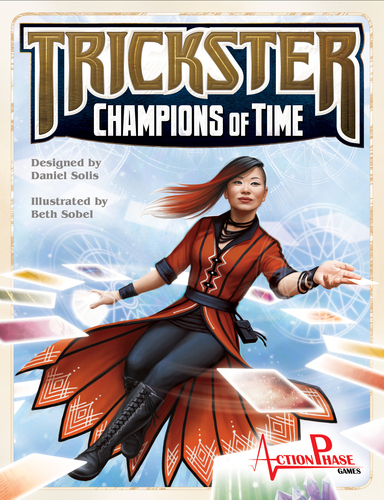 Trickster: Champions of Time continues the relationship between the designer, Daniel Solis, and the publisher, Action Phase Games – started with Kodama. In this card game, players try to take tricks (or perhaps better to avoid tricks) and score the least trouble points. The player with the fewest Trouble points will win the game. The box includes cards for 14 different heroes, each in the eight different colors in the game. However, for any particular game, you will only need the cards of 7 of those heroes – giving you a deck of 56 cards. The rules give you some suggestions for which heroes to choose for particular games as well as giving you guidelines for creating your own combinations. Each of the 14 heroes comes with a special ability printed on the bottom third of the card. The game will be played over three rounds. To start, the deck is shuffled and then six cards are dealt face up to the table to form the trash. Each player is then dealt a starting hand of cards (10 cards in a 4p game, 8 cards in a 6p game), and from this hand, each player will secretly and simultaneously choose a card to place face up in front of them to start their personal tableau. The cards in a player’s tableau at the end of the round will be used to calculate their score for the round. Each round will be played in a number of tricks – though the number of tricks is not set; the round will end at the end of a trick when at least one player has no cards left in their hand. In each trick, the first card is played by the Leader – it can be any card that the Leader wishes. The Leader then must execute the special ability of the card which he played. If the Leader is unable to fully take the special action, then it is ignored. The next player in order is the Trickster, and the card that the Trickster plays will determine how the rest of the trick plays out. After playing the card, the Trickster must also employ the special ability of the card played. If the Trickster’s card matches the HERO of the Leader’s card, then all successive cards must also match the hero type. If the Trickster’s card matches the COLOR of the Leader’s card, then all successive cards must also match the color. If the Trickster’s card does not match either the color nor hero of the Leader’s card, then all successive cards must also NOT match any of the Heroes nor colors previously played to the trick. Play passes clockwise around the table. Note that you MUST make a legal play, following the rule determined by the Trickster’s card, if you can. You may not choose to pass. Each time a card is played by any player, the special ability of that card must be executed if possible. The trick continues until a player “busts” – this means that they do not have a legal card to play – or until all players have played a legal card to the trick. If a player busts, that player must collect all the cards which had been played to the trick to that point. 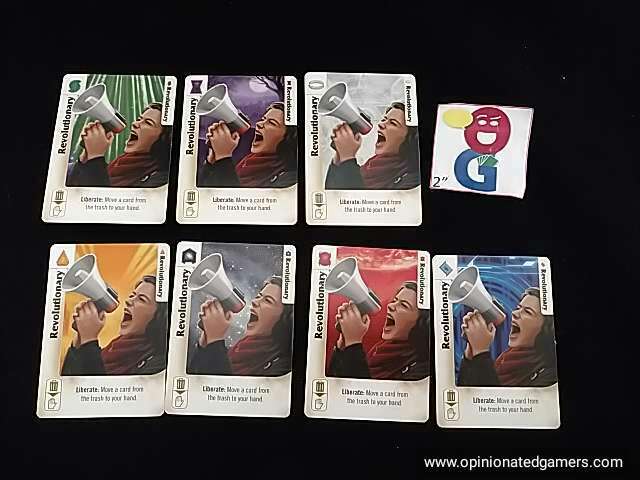 These cards are placed face up in the busted player’s tableau and organized by color. The player who busted becomes the Leader for the next trick. If all players are able to legally play a card, then the Trickster is considered to have busted. The Trickster must now take all the cards from the trick and place them faceup in their tableau. The Trickster becomes the Leader of the next trick. Again, tricks continue until the end of a trick when at least one player has no cards left in hand. At this point, the round ends and scoring happens. All players take any cards left in their hand and add them to their tableau area. At the end of a round, each player counts up their score. 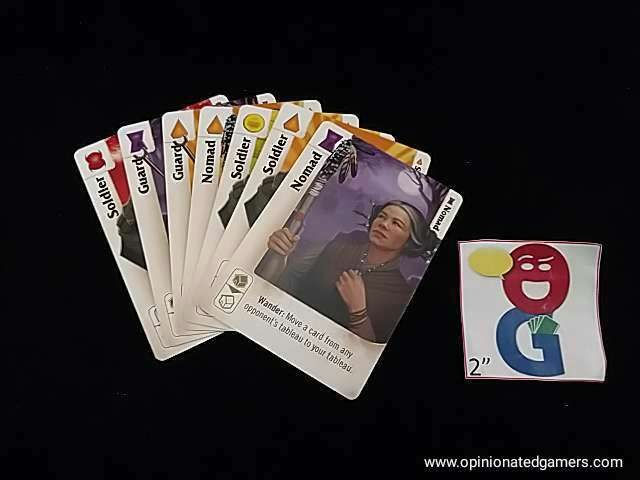 You score 1 Trouble Point for each card face up in your tableau, with the exception that you do not count cards in any color where you have more cards than any other player. (If you’re tied for the most in a color, then too bad for all of you, and everyone has to score points for that color). The game continues on for a total of three rounds. At the end of the third round, the player with the fewest Trouble Points is the victor. When reading the rules, the game seemed to be more about trick avoiding than trick taking, and this definitely proves true in reality. There are fairly strict rules about when to play cards, and you can’t choose to not play a card if you want… I found that in many of my games, my decision of what to play was pretty simple – I would either only have one card in my hand that matched the Trickster’s criteria, and so I was forced to play it to the trick or I wouldn’t have any matches and would “win” the trick. There are more decisions to be made when you are either the Leader or the Trickster. As Leader, you have the advantage of not being able to win the trick. You can use your lead card to either try to set up a particular kind of trick or you can simply use it as an opportunity to play a card for its special ability to help you later in the round. As the Trickster, you also have more latitude in your choices. You have three different options of how to follow the lead card. You should probably try to make sure you play a card where you won’t end up with the trick… though, if you can match the color, it’s probably OK to end up winning a colored trick as it will then be likely that you have the most of that color and score zero points for it. Unfortunately, when you’re not one of the first two to play, as I mentioned above, the game largely plays itself. You either have a card to play or you don’t. On the less frequent cases where you have a choice of cards to play, you can at least try to optimize your hand for later tricks or use a special ability that benefits you. But, so far, I’ve found this to be an uncommon occurrence. The game plays fairly differently based on the number of players. My first two games were with four players, and many of the early tricks went all the way around. It became a standard play to try to match the color of the Lead card to try to get a majority in a color (because you at least have a chance to avoid points with a large color trick; there is no mitigation for an all Hero trick). In my most recent game, with six players, it is much less likely for any trick to go all the way around – and the strategy of color loading doesn’t pan out. Generally, someone other than the Trickster ends up being the beneficiary of the monochromatic haul. 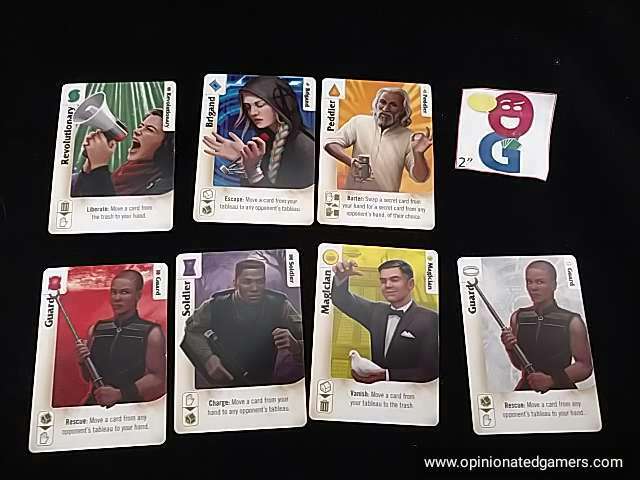 The cards are well done, with each of the individual heroes having a distinctive picture as well as enough space for the different colored background to be seen. The cards are double indexed so that both right-handers and left handers can see the Hero name as well as the color icon in the upper corners. However, there is a lot of information on the cards, and the special ability (and iconography short cut) are generally not able to be seen when fanning the cards. What this means is that for about the first round of any game, you’ll have to constantly be looking at the cards to remember what the special abilities are for your cards. Most of them are straightforward enough – and they all generally involve moving cards from one place (your hand, your tableaus, opponent hand, opponent tableau, trash, deck) to another. In each game, you’ll get a different collection of these abilities, but most of them simply move cards around. Many of the ideas in the game pique my interest. I like the idea of the mutable deck where each game is played with a different combination of cards. I like the idea of special actions on each card as this should give you room for clever play. However, in reality, the game feels like it is on autopilot, especially when you’re not the Leader or Trickster. More often than not, the game forces you to play a card or collect a trick – and there’s nothing clever in your play about that. Where you can make a difference is in the special actions – trying to manipulate the cards in the tableaus or changing the composition of your hand; but in the end, I wish that I had a feeling that I had more control over what happened in the game. It seems like there are more heroes in the “Trickster Universe”, and maybe having some more varied actions would improve my feelings on the game – because on paper it seems to have a lot of the attributes that I would love in a card game.